Warehouse Management Systems serve to streamline and organise multiple warehouse operations. There is a vast variety of such systems on the market. They can have different functions and designation, depending on the target customers. Some companies prefer to keep logistics and distribution in-house. Another very common practice in e-Commerce business is outsourced warehousing, which allows merchants to concentrate their resources on other aspects of their business. Although WMS is needed in both cases, 3PLs have special needs regarding functions. The main reason for this is that companies that handle warehouse inventory for other companies have multiple clients. So 3PL companies have to organise their work in accordance with the varying client’s needs. That is why 3d-party logistics companies are looking for a robust all-encompassing solution, which will help to deal with challenges, which are practically inevitable in such business. #1 Barcode Reader is an ultimate must-have feature for 3PL. They are widespread in different warehouse types and supply chain roles. Using barcode scanners increases operating efficiency, productivity, and accuracy of operations, which is especially critical when you do warehousing for many companies. #2 EDI is also a very commonly used function in a supply chain. EDI is what allows to automate document exchange and streamline order processing and invoicing. It serves as a replacement for the phone, fax, and e-mail communication with numerous suppliers and partners. #3 Slotting: its importance is often underestimated by e-retailers, but 3PL vendors, who store items with greatly varying sizes know how much proper (or improper) slotting impacts operations. Slotting is a function that helps determine the optimal storage location for each item in the warehouse. #4 Reporting and Analysis. 3PL organisations mostly use reports for billing purposes, like calculating fees for clients. They also help to understand what drives warehouse performance and identify bottlenecks and failures. Often, reports are requested and used by 3PL clients. #5 Web Portal. 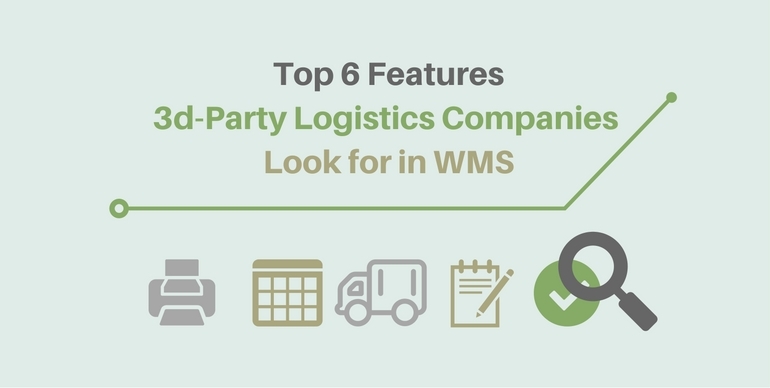 This feature is also very important for logistics providers as it improves inventory control. Web portals allow clients to access their data remotely from any computer. #6 Supporting Multiple Shopping Carts. The more platforms WMS supports, the more potential clients it has. Integration with shopping carts is what makes the process of implementation of WMS much faster and easier for customers. E-retailers build their stores on different shopping carts, and to retrieve order and product information, WMS need to be connected to the shopping cart that customer use. Elaborating integration takes a lot of time, which means merchants that use shopping carts that WMS doesn’t support will need to wait for the systems to integrate with their shopping cart. Read more about how Warehouse Solution Providers can benefit from integration with shopping carts. In case you own a Warehouse Management System, consider integration with leading shopping carts via API2Cart. It allows performing integration much faster and easier. You can try out how API2Cart will work for your business.